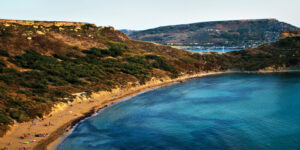 Malta is a small island found in the heart of the Mediterranean Sea region. With a population of 437,000 in just 318 kms, the island is one of the most densely populated places in the world. It forms part of Europe and part of the European Union (EU) since 2004. The island spawns interesting fortified cities like Valletta, Mdina and the three Cities, Vittoriosa Senglea and Cospicua, nice beaches and fishing villages, historic towns, spectacular sunrise and sunsets, amazing views and walks, delicious cuisine and vast history. All this gives Malta a unique identity, making it a destination worthwhile to discover. It is said that the sun is always out 365 days a year so whoever comes to Malta, sunshine is a guarantee. The island of Malta, or the Maltese islands since it is made up of an archipelago with Malta being the main island from which all the economic activity is conducted and Gozo its sister island. It is situated right in the centre of the Mediterranean Sea, thus in a very strategic geographic position, it is a gateway to Europe from Africa. For this reason throughout the centuries, Malta was always considered to be an interesting place for trade and commerce, shipping and most of all as military base. All this, justifies why Malta have been heavily colonised throughout the centuries: from the Phoenicians, the Romans, the Arabs, the Knights of St. John, the French and the English Empire between the year 1800 until the 1964, when Malta got its Independence and eventually became a republic in 1974 with the English, then totally leaving the island in 1979, when Malta stopped being used as a Military Base. Because of this historic background, Malta has always been a crossroads of cultures and this is reflected in its language, notwithstanding the fact of being a small island, Malta has its own language, the Maltese language which is a mixture of Arabic and Latin influences. It is considered to be a Semitic language but written in Roman alphabet. It is one of the languages recognised in the European Union. The language is spoken on a day to day basis by the locals. However, English is another official language in Malta. The British Empire colonised the islands for almost 2 centuries and its influence persists in the language where almost all Maltese people speak the English language fluently besides the native language. Like Maltese, English is taught at schools since a very small age. Valletta is the capital city of Malta. Since the year 1981, the city has been recognized by UNESCO as Unique World Heritage. It was built by the Knights of St. John in 1565 by the Grand Master Jean de Vallette, from which the city got its name. It is a mixture of mannerist and baroque architectural styles with a touch of neoclassical and modern architecture. Valletta is also a fortified city. While walking around the city, one can notice that it is surrounded by huge bastions and curtains which served in the past to protect against the enemy. 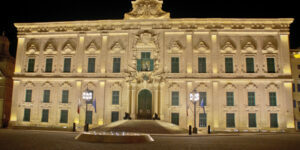 Various Auberge are found in the capital, which were built during the period of the knights of St. John with Auberge de Castille being the most prominent one which nowadays houses the offices of the Prime Minister of Malta. The city is build on an peninsular hill which lies on the Grand Harbour, a natural harbour considered to be one of the most beautiful harbours in the world. It is also an important harbour in the Mediterranean region with plenty of cargo shipping and cruise liner activity on a daily basis. Among many other things to see, while visiting Valletta it is recommended to visit the following: the President’s palace in the majestic St. George’s Square, The new parliament of the house of representatives, made by the renowned architect Renzo Piano, the museum of fine arts, the Co-Cathedral of St. John which hold the famous painting Saint Jerome, by Caravaggio and also the beautiful Arazzi by Mattia Preti, the upper and lower Baracca gardens for amazing views of the harbour and Castille Square. Although the size of the city is just 0.8 km2, it boasts around twenty five churches most of them erected by the Knights of St. John, the city is also full of renovated buildings turned into elegant boutique hotels and b&bs. In recent years Valletta has gone through a new era and new wine bars, cafe and restaurants have opened all over the city thus making it lively and vibrant day and night. The historic Strada Stretta was very famous during the British Rule where the sailors used to go to entertain themselves with a beer and live cabaret, has now been reborn again as an entertainment hub with live music venues, wine bars, cafes and restaurants. 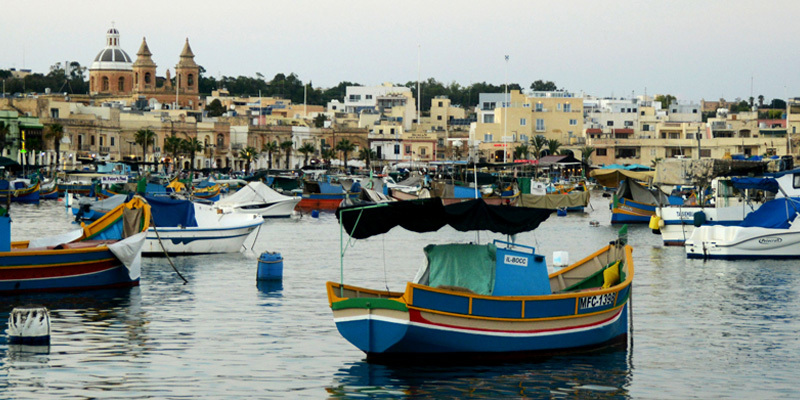 Located in the south east of the island, Marsaxlokk is a typical Maltese fishing village. It is a small village relatively quiet especially before and after the market hours, where one can enjoy a delicious fish or seafood meal which is the speciality here. 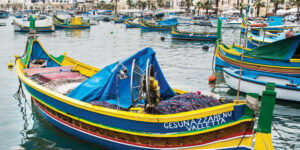 Most of the population in this village are fishermen and one can notice the traditional colourful fishing boats named in Maltese as Dghajjsa and Luzzu floating in the harbour. The place has remained typical in the course of the years and life here is simple as if time has rested still. From there one can also decide to walk to Delmarva for a swim in the popular rocky beach of St Peter’s Pool or take a boat trip to the Delimara for Euro 5. The area is picturesque with the rock definitely stand out in the view. Zejtun is also my hometown, the place where I grew up. For this reason, I am very profound of the cultural patrimony this town holds. In pic: Countryside walk in Zejtun. 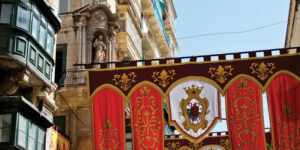 Zejtun, the Medieval and Baroque town is a major important town in the south east of Malta. This town has various interesting and unique traditions like Ghana, which is the traditional Maltese folk singing, the cultivation of olives and the production of oil and the flying of kites. The name Zejtun comes from Arabic and means “the oil from the olives”. It boasts a population of 11500 people. The Parish Church (Roman Catholic) started to be erected in 1692 by Architect Lorenzo Gafa’. The church is in Baroque style dedicated to St. Catherine of Alexandria. The Town was founded way before medieval times and various remains were founds which testify Phoenician and Roman presence in this area. 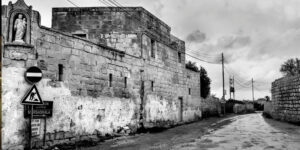 The old parts of Zejtun are a true testimony of medieval times with narrow winding streets, old houses and religious chapels. The area around the church is baroque with large squares, big palaces and houses with very interesting details. The old parish church is one of the few medieval/ Romanesque churches that still exist on the Island. Sometimes this church is referred to as Saint Gregory’s because of the statue of St. Gregory found nearby. The town feast dedicated to St. Catherine is celebrated in June. The area around Zejtun also offers the possibility of interesting walks in the natures which lead to Delimara for spectacular views of sunrise. The Maltese islands boast from some of amazing picturesque beaches from sandy to rocky beaches one can enjoy swimming in crystal clear clean sea. 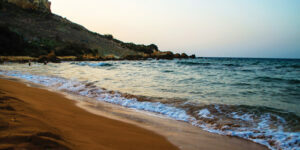 One of the most popular beaches is called Ghajn Tuffieha, Riviera Bay. Access to this beach is possible through a staircase which makes it definitely worth it to go through. The sand is fine and almost golden here and the sea is amazingly clear and clean. It is very popular among locals and foreigners and it is recommended to remain until the sun goes down and enjoy the spectacular sunset, a glass of chilled white one is highly recommended. Another beach which I recommend is in Gozo is a small beach named San Blas, this is a quite beach and is found a few minutes’ drive from the village of Nadur. For a bigger beach one can opt to go to Ramla L Hamra which on the same coastline of San Blas. This is relatively bigger than San Blas but also found in a picturesque area. The best place to enjoy sunset in Gozo is in Dwejra further down from the village of San Lawrenz. A visit to the blue lagoon in the Island of Comino is also recommended one can get the ferry to Comino from Cirkewwa which is also the place to get the ferry to Gozo. As the name clearly indicates “the blue lagoon” the waters here are incredibly clear. However, It tends to be rather busy in the peak summer months. But if one opts to go in the early hours of the morning before 10 AM one can manage to enjoy some relaxing moments. In the southern part of the island there are also some nice rocky beaches in Delimara’s St. Peter’s Pool as well as Marsascala and St Thomas Bay. 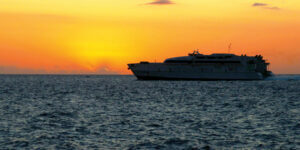 The last one is normally populated with locals who go there and enjoy some quality time with their families and friends. Martin Seychell is a Maltese national residing in Malta (Europe). He hold a Msc in Marketing from the University of New South Wales and works as a full time bank official. He is passionate about traveling to different countries to discover their cultures and capture them with his camera. 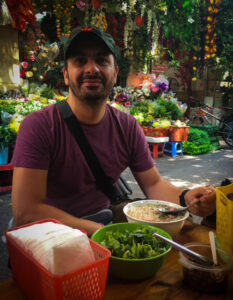 Martin believes that he rather be a traveller than a tourist and he simply like to discover the real thing about the place which are its people, it’s natural environment and its food. Food says a lot about a country’s culture and believes. 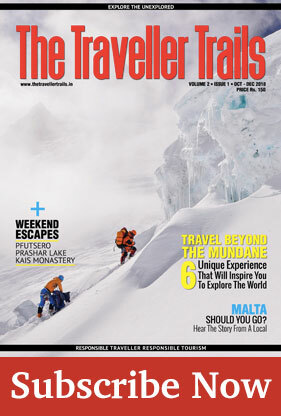 He believes that traveling has made him understand what the real values of life are.